When it comes to OS X, the cat is out of the bag. Apple senior vice president of software engineering Craig Federighi introduced the next iteration of Apple’s Mac operating system on stage during Monday’s Worldwide Developers Conference kickoff. 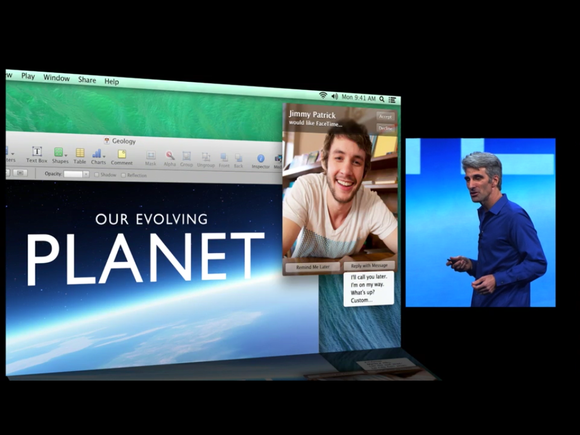 Federighi began his presentation with a sly nod to OS X’s past naming conventions. “We do not want to be the first software in history to be delayed due to a dwindling supply of cats,” he said. While “OS X Sea Lion” was briefly considered, Apple has instead decided to launch a new naming convention, based on inspiring places in California. Sadly, OS X Sea Lion will stay in Apple's naming vaults forever. The first of these releases—due out later this year—has been named OS X Mavericks, after the northern California surfing spot. 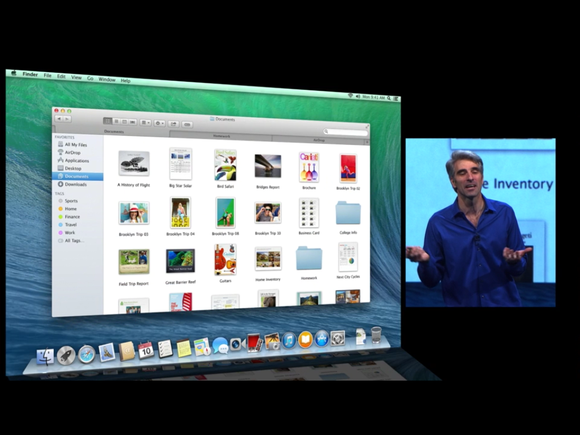 Federighi previewed three new features present in Mavericks: Finder Tabs, Tags, and Multiple Displays. In addition, Mavericks includes a slew of under-the-hood improvements; updates to Safari, Calendar, and Notifications; new password syncing options via iCloud; and brings Maps and iBooks to the Mac. If you use tabs in Safari, Finder tabs will feel very similar; Apple has taken the same basic window structure, allowing you to combine multiple Finder windows into a single window with tabs along the top. You can even move files from one tab to the other by dragging and dropping. Tags are OS X Mavericks’s answer to the Labels options of yore; you can tag files that are both stored in iCloud and on your local machine. You can add tags when saving documents: Select an already-used tag, or invent one on the spot. After you do, tags show up in your Finder sidebar. If you want to add a tag to older documents, just drag them into the tag category in the Finder sidebar. Tags are color-coded, and they’ve also been incorporated in Finder’s search feature, allowing you to search by tag (or multiple tags). Mavericks’s multiple displays improves greatly upon the lackluster offerings found in Lion and Mountain Lion. Linen second-screen placeholders are gone, replaced with complete support for full screen apps on screen number one and desktop display on screen number two. In addition, OS X will provide multiple menu bars and Dock offerings for each display, draggable full-screen apps, independent display support for Mission Control and Spaces, and second-screen support for AirPlay-connected HDTVs. After providing brief demonstrations of three major new features coming to Mavericks, Federighi briefly touched on under the hood improvements to OS X’s performance and power. 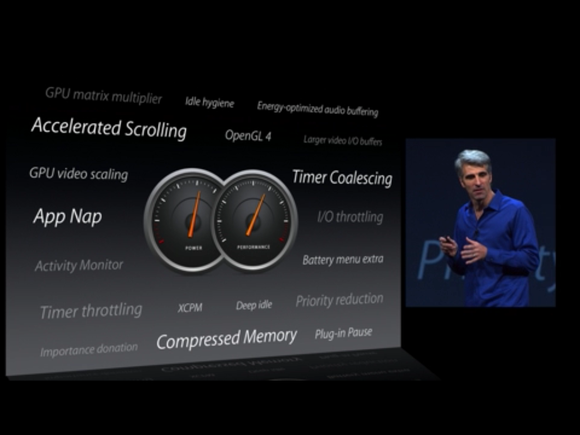 OS X has improved scrolling across the board, offering smoother and faster acceleration inside apps. Federighi demonstrated accelerated scrolling inside both Mail’s messages screen and Safari’s Reading List. Much like iOS’s app freeze, OS X’s App Nap reduces power to apps when they’re not in the forefront. 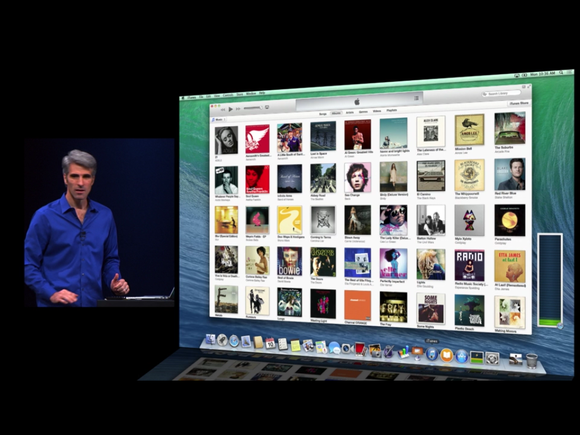 Federighi showed this feature off during his demonstration of Safari, using a CPU monitor to show the power drop-off when switching out of the program into iTunes. Compressed memory takes your inactive memory and compresses it to make free space available quickly. According to Federighi, users may see up to 1.4x speed improvements on an SSD from this feature. In OS X Mavericks, Safari has been given a giant under-the-hood overhaul, offering new speed and graphics acceleration. Safari also sports a new Shared Links pane, support for iCloud keychain, and new improvements to Reading List. iCloud keychain, which will sync to your other Macs and iOS devices, offers a secure silo to store your logins, credit card numbers, Wi-Fi network passwords, and account information. Notifications will soon have a little more functionality in OS X, thanks to Mavericks improvements. You can now reply inside certain notifications, including email and Messages; receive and dismiss FaceTime calls; get notifications from your iOS devices; update your apps in the background; and see notifications on your lock screen after waking your computer from sleep. FaceTime in particular looks to have received some of iOS 6’s delayed calling improvements; it appears from Federighi’s demo that users will be able to reply to calls with a message or schedule a reminder about calling them later. OS X Maverick’s Calendar interface is a stark change from Lion and Mountain Lion, stripping all seams and rich corinthian leather from its design. “No virtual cows were harmed in the making of this user interface,” Federighi drawled, to the crowd’s amusement. In addition to its interface overhaul, Calendar will now offer the ability to link your Facebook events; it also sports a new inspector with information on location, travel time, and weather. An OS X release wouldn’t be complete without a few new apps, and Mavericks includes two: Maps and iBooks. 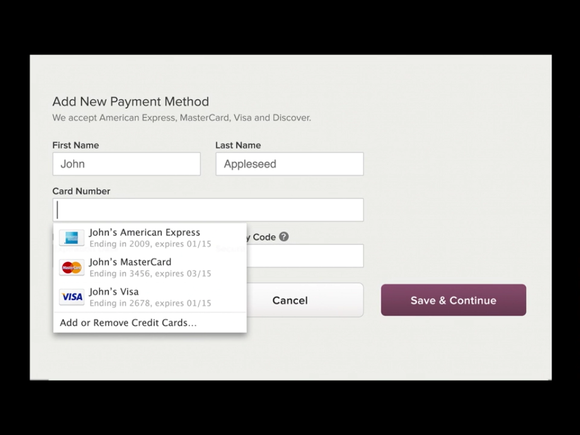 Granted, both apps aren’t new per say—they’re iOS apps, brought and fully realized on the OS X platform. Maps for OS X looks very similar to its iOS counterpart, though Federighi promised on stage that the app had seen improvements to its mapping data (presumably for both iOS and OS X). Maps on OS X features many of the same options found in iOS, including street maps, 3D cities, flyover, point-of-interest search, info cards for points of interest, and turn-by-turn directions. One nice perk of looking up turn-by-turn on the Mac: You can instantly push your directions to your iPhone (presumably running iOS 7). OS X Mavericks will be available “this fall,” according to Federighi; developers can pick up a preview from Apple’s developer portal today. Updated at 1:05 p.m. PT with more information on each feature and app mentioned in the keynote.